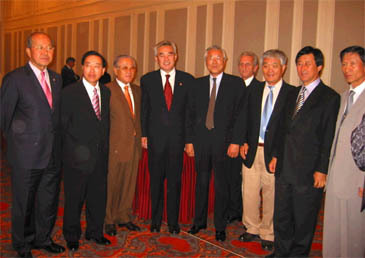 Choue Chungwon (fourth from left), president of the World Taekwondo Federation, poses with other WTF Executive Council members during the WTF's Executive Council meeting in Seoul on Oct. 4, 2004. SEOUL, Nov. 30, 2004 — The World Taekwondo Federation today launched a Reform Committee that is charged with thoroughly reviewing Taekwondo and its world governing body, and proposing recommendations to make Taekwondo more action-packed and transform the WTF into a more global and professional organization. The 11-member WTF Reform Committee, led by Dr. Nat Indrapana of Thailand, a WTF vice president and International Olympic Committee member, will draw up recommendations, after brainstorming sessions with Taekwondo experts and officials, to help raise the interest level of Taekwondo competition and ensure that it continues to be an official Olympic sport. The Reform Committee will meet from Dec. 7 to 11 in Seoul for its first gathering. "Reform has been a catchword in almost every sector of society in Korea, and Taekwondo is no exception," said WTF President Chungwon Choue, Ph.D.
"Taekwondo is in a transitional period following a change in the WTF leadership," Choue said. "Under my direction, the WTF is pushing for reform to transform itself into a more global, professional and efficient international federation, in line with the IOC's ongoing reform efforts." 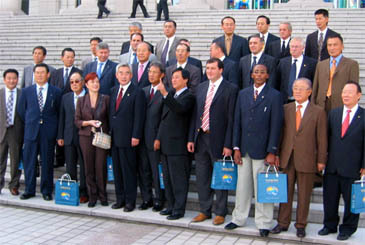 Choue Chungwon (fifth from left at the front row), president of the World Taekwondo Federation, poses with other WTF Executive Council members at Kyung Hee University in Suwon, Gyeonggi Province, on Oct. 4, 2004. At Choue's right is Thai IOC member and Vice WTF President Nat Indrapana, chairman of the newly launched WTF Reform Committee. Members of the Reform Committee make up a diverse and respected group, with seven Taekwondo leaders hailing from Asian, African, European and Pan-American regions, and four renowned and experienced leaders from outside the Taekwondo community. Among the Taekwondo leaders on the Reform Committee are Mr. Manuel Colmenero Firvida of Spain, president of the Spanish Taekwondo Federation and member of the WTF Executive Council; Mr. Sung Chon Hong of the Philippines, a member of the WTF Executive Council; Mr. Jizhong Wei of China, a member of the WTF Executive Council; Mr. Dai Soon Lee of Korea, a member of the WTF Executive Council and president of the Asian Taekwondo Union; Mr. Ahmed Fouly of Egypt, a vice president of the WTF and president of the African Taekwondo Union; and Mr. Dai Won Moon of Mexico, a member of the WTF Executive Council. The outside professionals are Dr. Giovanni Di Cola, a program director with the International Labor Organization in Switzerland; Mr. Andre Gorgemans, secretary general of the World Federation of the Sporting Goods Industry; Mr. Pierre Ferrari, founding partner of Tula Communications in Atlanta, Georgia; and Dr. Emanuel Bayle, a professor in management science at the University of Lyon in France. 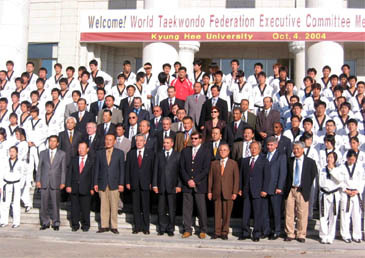 Members of the World Taekwondo Federation's Executive Council pose with taekwondo students at the Suwon Kyung Hee University campus in Suwon on Oct. 4, 2004. To achieve the goal of reforming Taekwondo across a wide spectrum of areas, ranging from competition format to refereeing, WTF Headquarters administration, financing, and marketing, Reform Committee members will be assisted by a team of about 30 Taekwondo experts. Each of the experts will deliver a formal presentation to the Reform Committee over two days of brainstorming sessions to be held on Dec. 9 and 10. The group is made up of WTF Committee members, WTF Headquarters staff, outside Taekwondo professionals, and other specialists. The Taekwondo experts group includes Mr. Luc Sougne of Belgium, chairman of the WTF's Public Relations Committee, and Mr. Young Tae Kim of Korea, chairman of the WTF's Technical Committee and member of the WTF's Executive Council. To gather additional opinions and recommendations for the future of Taekwondo, the WTF Reform Committee sent a questionnaire to the WTF's 177 member National Associations in early November. Those answers, along with responses to a shorter questionnaire posted on the WTF's Web site for other interested parties around the world, including Taekwondo professors, coaches, and practitioners, will serve as an additional tool in developing reform policies. 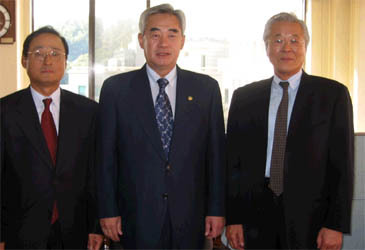 Choue Chungwon (center), president of the World Taekwondo Federation, poses with new WTF Secretary General Moon Dong-hoo and outgoing WTF Secretary General Lee Kum-hong at the WTF Headquarters in downtown Seoul on Oct. 6, 2004. The Reform Committee is scheduled to present its final report with a series of recommendations to the WTF in January. Their report is viewed as playing a critical role in the future of Taekwondo, both as an Olympic sport and as a vibrant and well-respected sport federation.